Medium Point: Black Gel Ink. 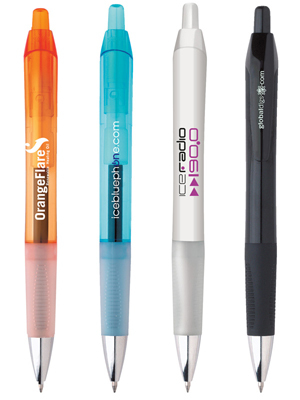 All clear pens include chrome plated section and frosted clear grip. All pens include chrome plated section. Imprint Area: 1 5/8" x 5/8"
Packaging: Standard - 9 lbs. (approx.) @ 250 per carton. Special packaging (click here).